...is actually probably on the mainland. While I have only been wandering the shores of Emerald Isle for a year in this decade, I have been eating burgers in the area for a number of years. Since 2003 I have eaten good ones as far east as No Name Pizza, Cubbie's, and Andy's in Beaufort and as far south as Wilmington's P.T. 's Grille. The quest for a great burger is a life long journey. I first sampled a Big Moe at Odell's in Mount Airy in 1963. Fortunately for all of us Odell's is still cranking out great burgers. I have been lucky enough to sample Five Guy's Burgers from Northern Virginia. Recently I have enjoyed Cookout burgers on my travels to the coast. Still until walking in the doors of the Fairway Restaurant on Route 58, my favorite burger was from Burger in the Square in Roanoke. Actually Fairway is a favorite spot of ours for lunch or dinner. I love some of their pork chop dinners, and I have written about them before, Dining along coastal side roads, The Fairway Restaurant. However, it was just the other day that I had a burger there which confirmed the excellence of one that I had enjoyed there recently. I love grilled burgers, and the ones at Fairway definitely tasted grilled. We actually ended up there the day of the Lowe's Home Improvement Store's opening. Burgers were promised at Lowe's but were cut off at exactly 1PM so we bailed and headed to Fairway where we got a far, far better burger. 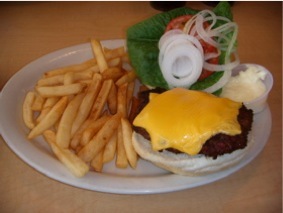 As I enjoyed the Fairway Burger, I compared it to all the great ones that I have enjoyed. Without a doubt it is the best that I have had along the Crystal Coast. I think for pure taste it may well outshine the Burger in the Square in Roanoke which is fried not grilled. Still I might have to validate that opinion on my next trip to Roanoke. 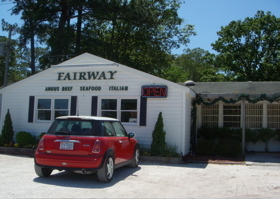 For now, I have no doubt that the Fairway Burger holds the crown for the best burger on the Crystal Coast. I am willing to investigate challengers, but I will look only at serious challengers that come highly recommended.